WINTER CAMP 2019 Registration now OPEN!!! 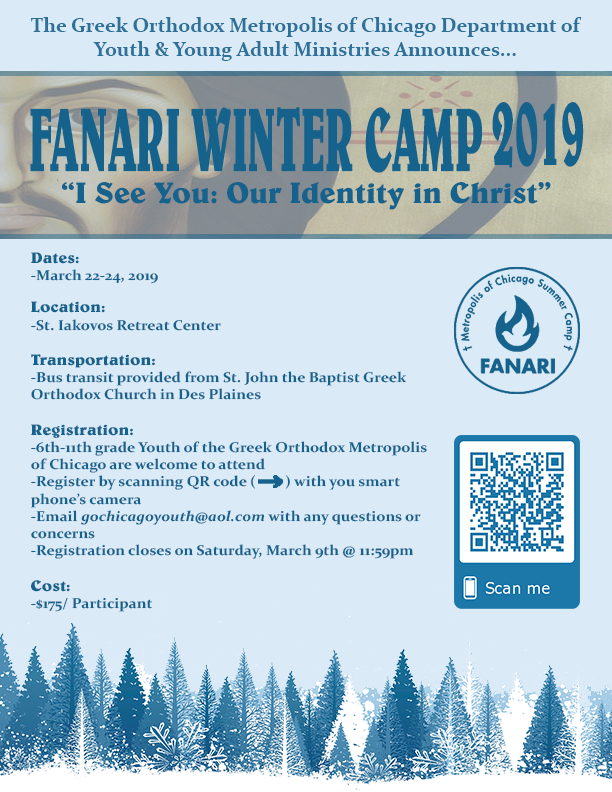 Posted on January 9, 2019 by Fanari Camp | Comments Off on WINTER CAMP 2019 Registration now OPEN!!! The Metropolis of Chicago Youth and Young Adult Ministries Fanari WINTER CAMP Registration is now OPEN!!! Come enjoy a wintry weekend retreat filled with fellowship, discussions, skits, worship, olympic games and sing-a-longs. You won’t want to miss out on all the fun we have planned! Comments Off on WINTER CAMP 2019 Registration now OPEN!!! COME RING IN THE NEW YEAR EARLY WITH YOUR FANARI FRIENDS! St. Demetrios of Elmhurst (893 N. Church Rd. 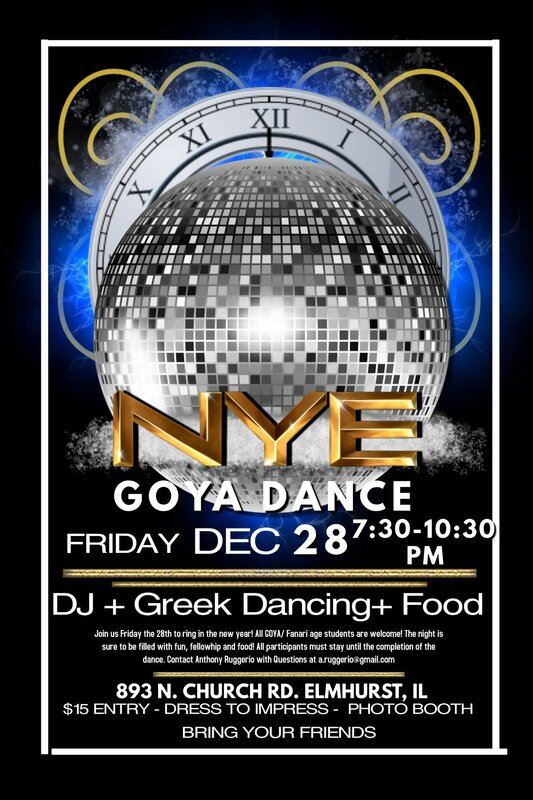 Elmhurst) is hosting a “New Year’s Eve GOYA Dance” (open to grades 6th-12th) on Friday, December 28th from 7:30-10:30pm. Reunite with friends, while enjoying a night of music, dancing, food and fun! All participants must stay until the end of the dance. $15 entry–Dress to Impress–Greek Dancing–Photo Booth–FUN! 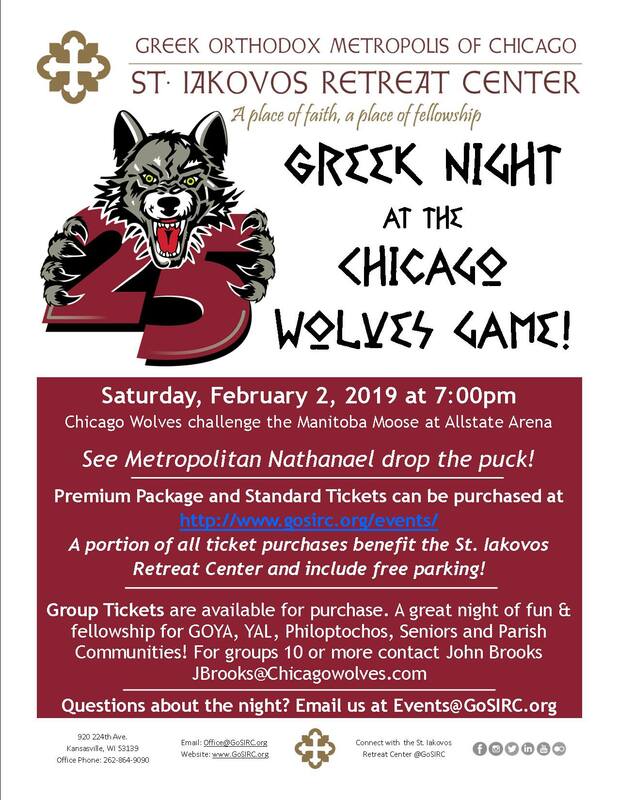 The St. Iakovos Retreat Center invites all to GREEK NIGHT AT THE CHICAGO WOLVES GAMES at Allstate Arena! See Metropolitan Nathanael drop the puck! 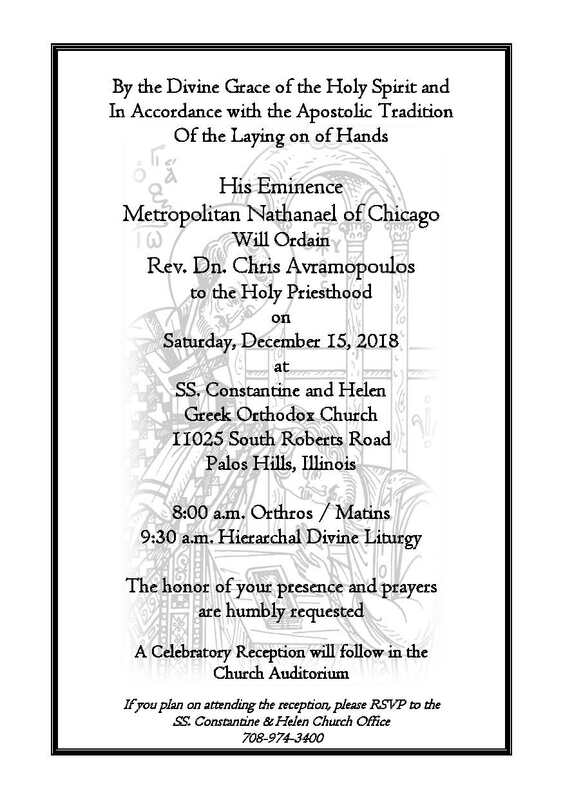 With the blessings of His Eminence Metropolitan Nathanael, please, join our Fanari Camp family in expressing our heartfelt love and joy, as our Fanari Camp Director, Deacon Chris Avramopoulos, will be ordained to the Holy Priesthood on Saturday, December 15, 2018, at SS. Constantine & Helen Greek Orthodox Church, Palos Hills, IL with 8:00am Orthros and 9:30am Hierarcal Divine Liturgy. All are welcome to attend! We wish him God’s strength and guidance in his new assignment, as assistant Priest in the parish of SS. Constantine and Helen in Palos Hills, IL. If you are unable to attend, please keep Deacon Chris and Diakonissa Nicole in your prayers on this day. Kindly RSVP to the church office if you do plan on attending the reception afterwards. 708-974-3400. It’s REUNION TIME!!! Fanari Camp 2018 may be over, but it’s time to celebrate the friendships and fun that we created all summer long! Come enjoy a night of music, dancing, food and fellowship with all your Fanari friends and staff! 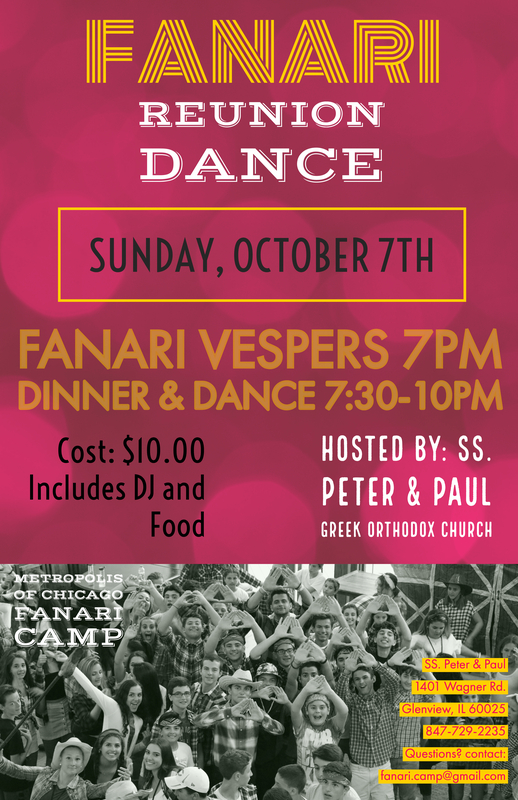 A Fanari Vespers service will begin at 7:00pm, with dancing and dinner to follow. Gather your friends, new and old, to reconnect and enjoy the night together, as one family in Christ. Dress is casual and there’s no need to rsvp…just show up and join in on all the fun. Hope to see you there! Hosted by: SS. Peter & Paul Greek Orthodox Church, 1401 Wagner Rd. Glenview, IL. Our final session of the summer has come and gone and we’re so very thankful for all that we experienced and felt in our one week together. New friendships were formed and old bonds were strengthened, with Christ being the center of it all. 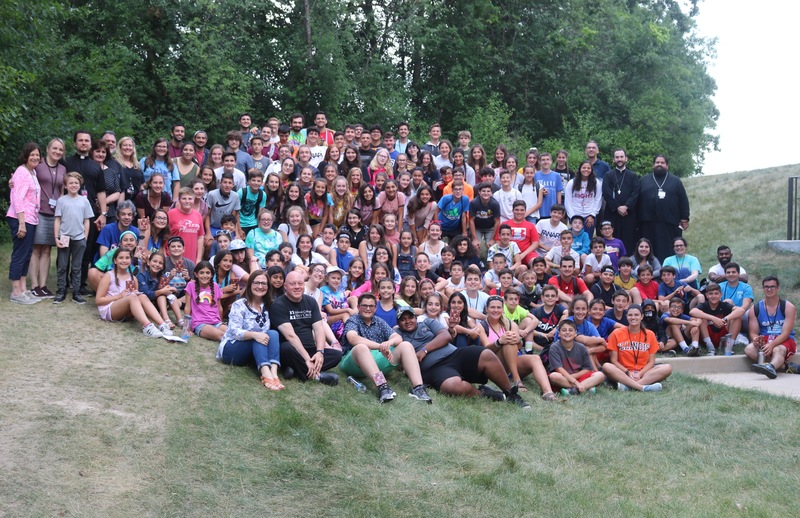 After many pictures, and some tearful goodbyes, Session 4 is complete and the campers have all returned home, leaving the grounds of the St. Iakovos Retreat Center quiet once again. Rounding out the theme of our week, “Four Evangelists: The Four Doors to Christ”, we celebrated the Divine Liturgy with the Very Rev. Fr. Christodoulos Margellos, Fr. Ciprian Sas, Fr. George Pappas, Fr. Athanasios Minetos and Deacon Chris Avramopoulos. What a beautiful site to see all our children worshipping together, as they stood and sang the hymns they learned in Chanting class this week! We concluded with a trisigion for our beloved Metropolitan Iakovos, Fr. Bill Chiganos and all those Fanari campers, clergy and counselors who have fallen asleep in the Lord. May their memories be eternal! Before departure from breakfast, we ended our morning with prayer and sang the hymn, “Who is so great a God”. We pray the campers will keep that light, the Fanari, within them throughout the year and continue to attend worship services in their own parishes and build on the connection to our faith they felt this week at camp. 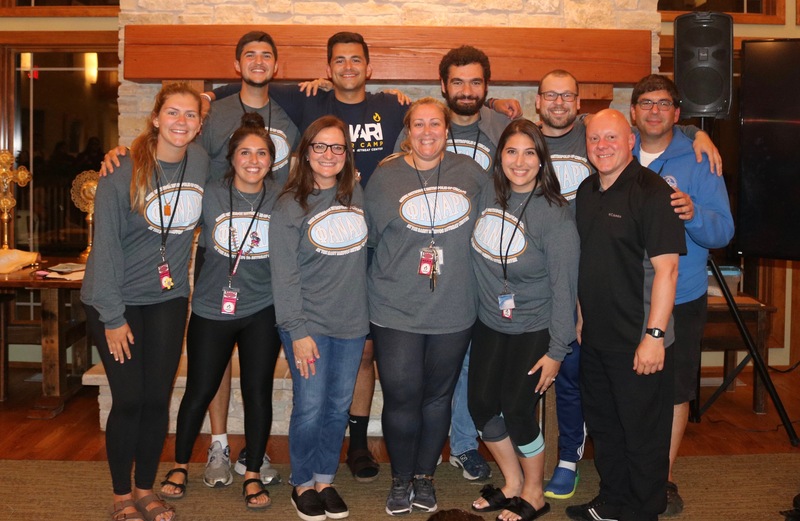 A big THANK YOU to all the Session 4 clergy and counselors for their love and dedication to our program, which helps bring our campers closer to the church and having a living relationship with Christ. Finally, to our amazing counselors and Core Staff, who attended all 4 sessions of camp this summer, may you take the relationships you’ve made, the experiences that have touched you and the lessons you’ve learned, and use them to grow in your faith and continue down the path that Christ has set before you. May God bless and protect you always, and may you finally get some much deserved sleep! 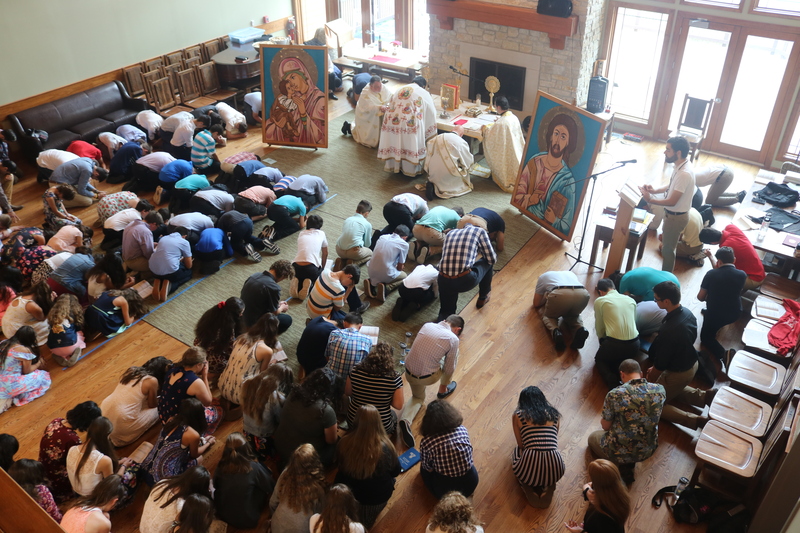 We give thanks to the Lord for allowing us to spend another beautiful and fulfilling summer together, in our home, at the St. Iakovos Retreat Center. We’ll see you all next year for Fanari Camp 2019! Check out Session 4 Day 7 Photos! Session 4 is coming to an end but the laughs, love and friendship will last far beyond our week together here, at Fanari Camp! Rain showers overnight put a damper on Athletics, our Flex activity today, but our counselors led campers in some group games indoors. Discussions were being wrapped up in Bible Study and OL, and everyone was busy in Theater going through the final dress rehearsal before our evening activity tonight. Free-time found us indoors, as the rain kept us from heading outside today. Some campers watched the movie “Shrek”, while others visited the Camp Store for last minute candy and swag purchases or just enjoyed spending some quality time with each other and working on their skits. All summer long, ice cream bars have been generously donated each day to campers, in honor of Nun Theologia. What refreshing treats for all to enjoy! Thank you!!! We had a special visitor today, Mrs. Sophia Cocokios, whom we honored with an icon of the Panagia for preparing and baking all our prosfora for our Divine Liturgies the entire summer. May God continue to bless and keep Sophia in His loving care! Wrapping up our last evening activity for the week, is our annual Skit Night. Andrew Poteres guided our campers all week long, to prepare their skits and entertain us tonight. Congratulations to all our performers for an outstanding evening! Even Zeno, with his words of wisdom, made a comeback this week. By far, the nights biggest hit was when counselor Georgia Danos was tricked into getting a whip cream pie in the face! Thanks for being such a great sport. The fun meter was at an all time high today! It’s been a spirited week for all of our cabins, but after all the coins were counted, the final Spirit Winner for Session 4 is the DELPHIANS! All our campers and staff did a tremendous job showing unity, love and kindness all week long. We pray that you all keep the Holy Spirit within once you return home, with your words and actions, as you did here at camp. Great job for a fantastic week! At Closing Day we honored the 11th graders who attended camp for their last year. We pray that they take what they learned this week and continue to grow closer to Christ and His church. Our 4 week staff, who gave of their time and talents to spend the entire summer with us, was also recognized, as were the rest of the counselors who were with us multiple and single sessions. We are truly blessed at Fanari Camp with outstanding staff and clergy who make our program come alive each session! Ending the night, Deacon Chris told us to keep the relationships that we’ve established at camp alive throughout the year, to love one another, and to have hope in the Lord. He also challenged us to take ownership of our faith and to lead others to Christ. A perfect ending to such a blessed week together, growing in our faith and learning more about ourselves and each other! For one last time, we all sang, “Deep” and a round of “Father I Adore You” before we dismissed to our cabins for our last devotionals. Campers are packing up their belongings so they are ready to go before Divine Liturgy in the morning. May God watch over us all, as we spend our last night together before departure tomorrow. Check out Session 4 Day 6 Photos! The fun and friendship continue, as we shift our daily schedule for our Picnic Day, where we spent the morning together, traveling to two different activities. First our clergy entertained us with a game of Trivia, which included intriguing categories and questions. Our second rotation involved ten different “Minute to Win It” games, that showcased our campers talents at each station. It was a great morning relaxing with each other and having some good old fun! Time to grill the souvlaki and begin our PICNIC! Watermelon, chips and lemonade rounded out the perfect picnic meal. Campers were free to roam to all our outdoor activities to enjoy the free day with friends. It was the Athenian’s turn to visit the Marina, where they navigated the boats around Friendship Lake. Campers were also able to visit the animals at the barn and enjoy Maria’s Wacky Wagon ride! Our goats, Scout and Jem welcomed the campers along with the Alpaca, horses and ducks. Ending our picnic day was the annual Clergy/Counselor vs. Camper softball game!!! Dn. Chris and Maria gave us play by play commentary where the counselors were rallying until Metropolitan Nathanael joined in on the game, and suddenly the score went to 14-11 in the campers favor! Great sportsmanship and fun for everyone involved in today’s game! Then it was time to Giddy up and DANCE! Campers were dressed in their finest cowboy and cowgirl attire to get to steppin’ and line dancin’ the night away. Downstairs in our outdoor fireplace, campers roasted marshmallows for s’mores, while listening to saint stories with Fr. Demetri. A fantastic night, dancing, enjoying moments together and joining in on all the fun, as one family at camp! Before our joyous and busy day came to an end, the Athenians and Delphians were awarded our spirit sticks for the night for continually showing the light of the Holy Spirit within, throughout the day. Finally, at Closing Day, Dr. John Fotopoulos talked about being a thermostat rather than a thermometer, as a thermostat makes change and a thermometer goes along with the environment. We should all strive to be the example of the Orthodox faith and be the person that God wants us to be. Commit and be the thermostat. What a beautiful day filled with so many of God’s blessings! We look forward to our final full day together tomorrow, and creating more memories here, at Fanari Camp. Check out Day 5 Session 4 Photos!